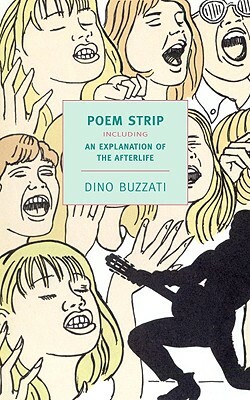 Jeet Heer’s recent post over at Comics Comics about Dino Buzzati’s Poem Strip reminded me that I’d been meaning to write about this book. I would say that between Jeet Heer and Valentina Zanca I can’t really add anything more into the discussion of its history and historical/artistic importance. What I can discuss, however, is its influence on my own work. I discovered Poem Strip by accident while at a somewhat hip book store in DUMBO. I was there for some comics event and I was trying to pass the time while waiting for people I knew to arrive while not talking to the other people who didn’t really seem like they wanted to talk with me anyway. I had never heard of this book nor of the poet. My only interaction with this book was picking it up, reading it in the store, and being struck by it very deeply. I didn’t have enough money to buy the book, so I left it there and brought my memories and experience with me. I mulled over what I could remember of the images as I drove home. For the next week or two, all I could think about was this guy. I loved the way the styles of the images would shift to go with the words. Particularly, I loved the way some of the people were rather realistic where others were more exaggerated. This image in particular stuck with me. 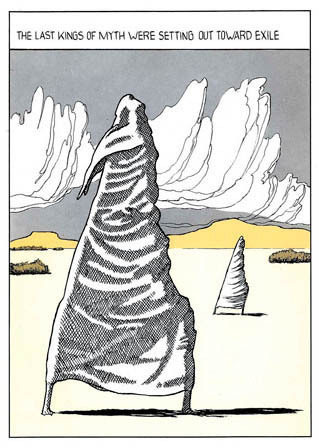 Something about the way the figures were drawn made them almost monolithic. They weren’t men any more. 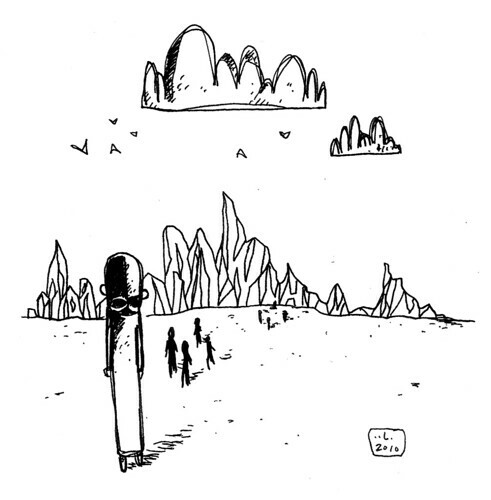 Their shapes mirrored the clouds, the mountains. They became the land. Of course, since I didn’t actually leave the store with the book my memory of the details faded with time. My experience of this book became more about the memory of this book, the memory of the feeling, its impression on my thoughts. Later, I discovered that my neighbor and good friend owned a copy of this book. I took it home, read it, re-read it, flipped through it. But the impact just wasn’t the same as the first time, that first accident. It’s funny how sometimes your memory of what was becomes more than what is.